A cheese fondue is the perfect way to start a fondue party. It's a great first course because it's a classic fondue dish that will immediately get your guests into the fondue spirit. (Although, I'm relatively certain that you could coerce your friends into any spirit with a pot full of delicious melted cheeses.) Emily and I did a little research on cheese fondues and came up with our own recipe. We decided to omit the Kirsch (cherry brandy) because we felt it didn't really add that much to the flavor and we hate having to buy a bottle of liquor for a recipe when you only use a few tablespoons of it and the rest ends up sitting in your pantry collecting dust. The rest of the ingredients are pretty standard for cheese fondue except that we chose to use three different types of cheese. Really nutty swiss cheeses are delicious so we wanted to have both Comte and Emmental. And, of course, you have to have Gruyere cheese to make it a traditional Swiss fondue. Grate all the cheese into a large bowl. Toss with the flour, paprika, nutmeg and pepper. Use a medium sized sauce pan on the stove to make the fondue. Cut one clove of garlic in half and rub the inside of the pan with it. On medium high heat bring the white wine to a boil and then slowly add the cheese, constantly stirring. 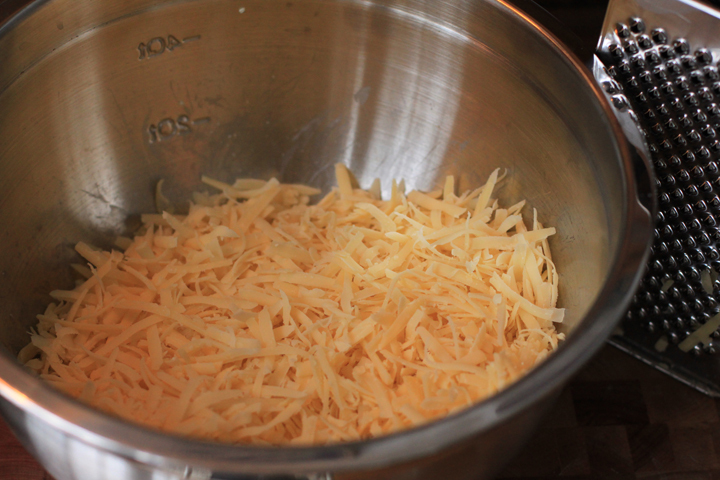 When all the cheese is melted, add the lemon juice, stir and remove from heat. Pour into the fondue pot and serve over a flame.